Al-Madinah Cultural Center and the College Day Committee would like to request the presence of high school students at College Day. The event is aimed at high school sophomores, juniors and seniors who are of the Muslim faith. We would like these soon to be college students to feel the sense of community that exists on our diverse campus and we would be more than glad to have your school participate. College Day, which will begin 9:00am, will kick off with short and fun informational activities aimed to give high school students a perspective on what it is like to be a Muslim U of M student. The day will also consist of a variety of sessions and workshops that are centered around the preparation and integration of high school students into university life. We want future Muslim students to feel comfortable in adjusting to University life while still maintaining core Muslim values and etiquette. We request that students R.S.V.P no later than November 23rd, 2015. We hope your school is able to accept this invitation and we look forward to hearing from you. 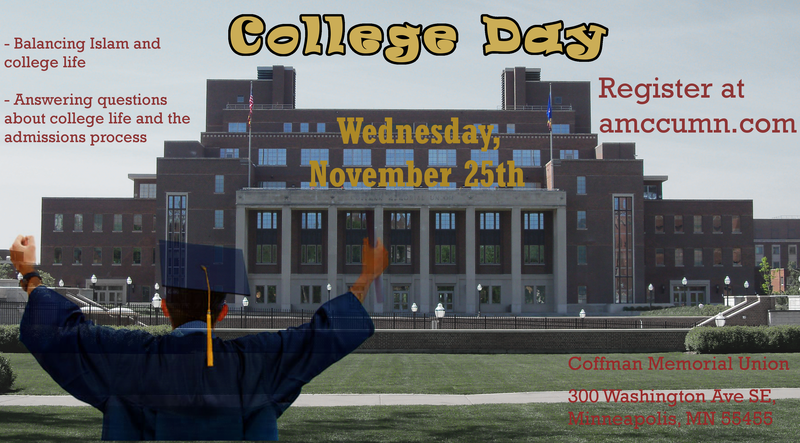 Here is the link to have your student register for the day: http://z.umn.edu/collegeday2015. The evening will commence with dinner and entertainment. Please inform us of any dietary requirements students may have.